Volunteer chapter leaders promote nursing excellence in communities worldwide. Making a difference at the local and regional level. Chapter leaders are a vital part of moving Sigma forward! Thank you for your dedication to our members and the profession of nursing. As you may already know, all Sigma chapter leaders have access to the All Chapter Officers workgroup in The Circle. Sign in to access a community calendar of deadlines, training sessions, and other dates of importance. Don’t forget about opportunities to connect with your peers at the Sigma biennial convention or Leadership Connection. 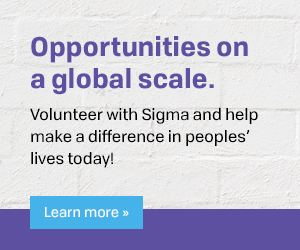 You do a lot for your chapter members; let Sigma help you take full advantage of the benefits of your membership in this global organization of choice for nursing. Find resources to help you in your chapter leader role, access the Chapter Product Catalog, and connect with Sigma chapter leaders from around the world. Sign in to the site using your email address and Sigma password. Apply to receive international and regional recognition. Search the chapter database by name or location. Pull rosters, access the induction and Print-on-Demand systems, and submit items such as Sigma Update news, officer and committee members, chapter annual report, bylaws, and verification of fees form. Learn your responsibilities as a delegate for electronic and in-person House of Delegates meetings. Learn more about Sigma's Global Regions. Receive information and resources about how to start a Sigma chapter.